Solid State Technology Association JEDEC, has unveiled the Universal Flash Storage version 3.0 specification. The headlining change to the UFS standard is that version 3.0 will offer “a 2x performance increase over prior versions of the specification”. That’s transfer speeds of up to a maximum theoretical 2.9GB/s. The new standard also adds niceties such as lower power consumption figures, temperature event notifications, and the ability to operate within an extended temperature range (-40C, 105C). 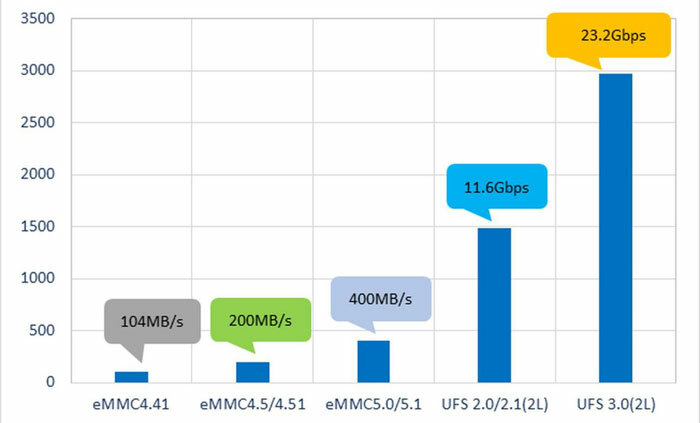 In a press release on the JEDEC site, we are informed that UFS 3.0 is the first standard to introduce MIPI M-PHY HS-Gear4, with a data rate of up to 11.6Gbps per lane (over its two lanes it can provide 23.2Gbps). Thus it delivers a 2x performance increase over the M-PHY HS-Gear3 as used in UFS 2.1. UFS 3.0 is expected to be deployed in smartphones and other smart devices but also in automotive applications. Targeting specific needs of this latter industry segment, UFS 3.0 can function at an extended temperature range and includes a host control mechanism for improved device data reliability. The extended temperature range and temperature event notifications won’t solely be useful in automotive segments and the specification's lowered power consumption will be a good thing all around. With MWC 2018 around the corner we might see some mobile device makers mention UFS 3.0 but it’s likely to take a bit longer for the first UFS 3.0 devices to reach the market. 250x…now THAT'S something I could get behind!